Has Britain Passed Peak Energy Demand ? If we look at the graph above, on left, (and by clicking it it should be enlarged and easier to read) we can see that in 1948 the UK used about 45 TWh/year of electricity, and that by 2003 it had risen to about 375 TWh/year, somewhat over an eight-fold increase. In the 50’s and 60’s there was much talk of electricity becoming too cheap to meter. Many economists and politicians seemed to envisage growth of demand going on indefinitely, and being met from nuclear and fossil fuel use. From the 1960’s an embryonic environmental movement started pointing out the many problems associated with such a path. They began to argue that we needed to use energy very much more efficiently, and to develop renewables. It looks like UK electricity demand may have peaked in 2003, stayed level for a few years then since 2007 it seems to be declining. Looking at the bar chart (on the right, above) of individual electricity usage from 2008 to 2013 it shows a fall of nearly 10%. Gas use for heating and hot water seems to have fallen even more, by 25% per household, due to improvements to boiler design, better insulated pipes and houses. 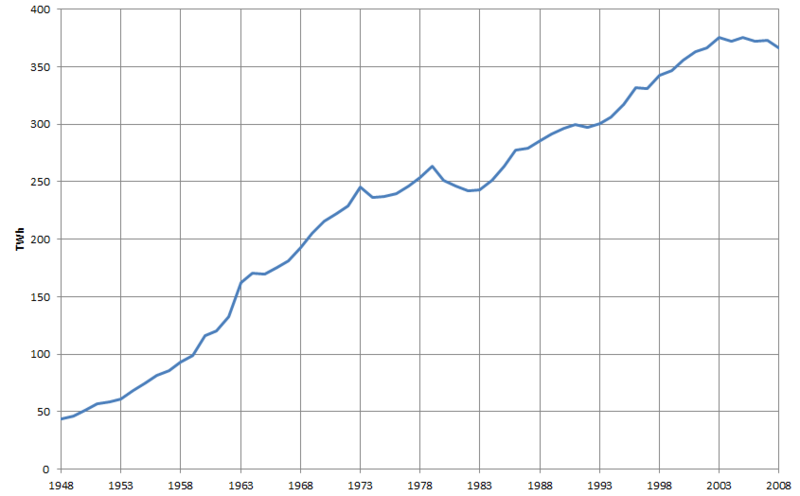 Oil use seems to have peaked in 1995, stayed level until 2005, then declined steadily since. This really is good news. If we can curb energy demand while ramping up renewables, then, and only then, do we stand a chance of securing both energy security and carbon reductions. Today there was a report by Roger Harrabin on the BBC looking at this decline in energy use. Although new forms of electricity wastage have crept in with big screen TVs and the standby functions of so many gadgets, the improvements in the efficiency of others has more than compensated. So for example new A-rated fridge-freezer uses 73% less energy than they did 20 years ago. Lighting has made even bigger improvements with old incandescent bulbs producing only about 15 lumins/Watt, compact fluorescents 60 lm/W, LEDs 80 lm/W, and the best tube lighting up now to 110 lm/W and lights of up to 200 lms/W should soon be in common use. Roger Harrabin quotes Joanne Wade from the Association for the Conservation of Energy “The figures for households are very good news, but frankly they have been achieved without a great deal of government effort. Imagine what we could do with a proper strategy for demand reduction. We have a long way to go.” Yes, absolutely! This entry was posted in Energy on 19 December 2014 by Richard. 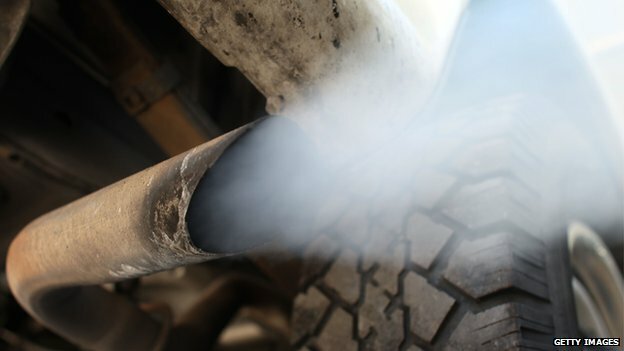 Air pollution is killing about 29,000 people a year in the UK. The situation is better than it was, but Britain has been too slow to improve air quality and as a result the European Commission has been forced to take legal action against the UK government. What should the UK government do? Paris is suffering from air pollution too, and the particulates from diesel engines are the number one culprit. Anne Hidalgo, the mayor of Paris, says diesel cars should be banned completely from Paris by 2020. Presumably she’d also want to ban petrol cars which are somewhat better from the point of view of local air quality, but worse in terms of carbon emissions. She has stated she only wants ultra low emission vehicles on the city’s main thoroughfares. There is much evidence that many cities have passed Peak Traffic. As Hidalgo pointed out “Today 60% of Parisians already do not have cars, compared with 40% in 2001. Things are changing quickly.” Car ownership and use is falling in many cities around the World, including London and Paris. Anne Hidalgo wants to see a doubling in the number of cycle lanes, a big increase in pedestrianisation and investment in public transport. In London Boris Johnson wants to spend £330 million by 2020 on rolling out the Ultra Low Emission Zone, investing in 2,400 hybrid buses and 300 electric buses, and assisting improvements in the taxi fleet. All this is welcome, of course, but more could be done, particularly encouraging people to get rid of their private cars and switch primarily to walking, cycling and using public transport, with perhaps car clubs for those times when a car really is the best option. In London enormous numbers of cars are privately owned but not used a great deal. Community car clubs would help people save money, further cut their car usage, and also help generate greater social cohesion. Leasehold electric and hydrogen fuel cell cars will, hopefully, gradually replace privately owned petrol and diesel, with the manufacturers being responsible for maintenance, so overcoming built-in obsolescence. Meanwhile, this week, as the climate talks are underway in Lima, Peru, George Osborne is pumping billions of pounds of British taxpayer’s money into oil and gas exploration and into building more roads and airports. Cameron’s claim to be “the greenest government ever” always was pretty risible: words fail me to say how it looks now. If we want to reduce deaths due to local air pollution, or to start to take a leadership role on climate change, it is imperative that we get rid of this ghastly government and get more Green voices into Parliament. Paradoxically the Tory Boris Johnson, and the Socialist Anne Hidalgo might welcome such a move as a help to their efforts in improving the air quality in the cities they govern. This entry was posted in Environmental on 11 December 2014 by Richard. Podemos has exploded onto the Spanish political scene. It was founded in January 2014, only started to accept members from late July, and yet now, just five months later, it has over 260,000 members. By comparison the Green Party of England and Wales celebrated the doubling of its membership, from 13,809 at the start of the year to 27,618 on 2nd December. So if our Greens can rightly be proud of their surge in membership, how on earth did Podemos achieve such extraordinary and explosive growth? Podemos is a new kind of political party. It grew out of the Occupy movement that burst onto the streets of Spain, and many other countries during 2011, and which I blogged about at the time. ‘Los Indignados’, or the ‘The Outraged’, occupied the streets of Madrid for weeks starting on May 15th 2011, the date becoming immortalised into the M15 movement. Hundreds of small groups around the county planned protests, linked-up through social media and tried to envisage a different political future. Leaving NATO, re-structuring the Spanish debt, introducing a basic citizen’s income, cancelling some free trade agreements, rigorously cracking down on corruption and tax avoidance and evasion, nationalization of much infrastructure are just of few of the policies they’ve been debating. 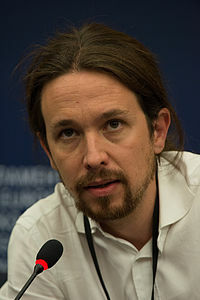 Pablo Iglesias Turrion, a Madrid based political scientist and frequent speaker on TV, became their most recognisable spokesperson. He said they should form a political party only if they could get 50,000 people to pledge support, which they achieved within 24 hours. Podemos has hundreds of local circles of supporters who meet frequently and organise online. These local groups can initiate ideas and policy suggestions. Online voting via Reddit or other platforms allows ideas to come from the grassroots with great speed. Capturing the wisdom of the crowd is a core value of Podemos. Money is raised almost entirely through Crowdfunding online donations. Membership of the party is free, which may partly explain the sheer numbers of new members. The unemployed, penniless and indebted are positively encouraged to become politically active. Podemos in some ways draws more inspiration from some of the political parties of Latin America, from Hugo Chavez’s Venezuela or Jose Mujica’s Uruguay, than to any of the parties of Europe. At the Euro Elections in May they got five MEPs elected, including the charismatic Pablo Iglesia Turrion. In solidarity with the poor their MEP’s only accept less than a quarter of their salaries. They currently have no elected politicians at either the local or national level within Spain. That will undoubtedly change: Spain is due to have a General Election by December 2015 and some polling is suggesting that Podemos could become the biggest party and form the next government. Now that really would enliven Spanish and European politics and provide a refreshing challenge to the corporate and banking oligarchs and all the political parties in their control! This entry was posted in Politics on 5 December 2014 by Richard.